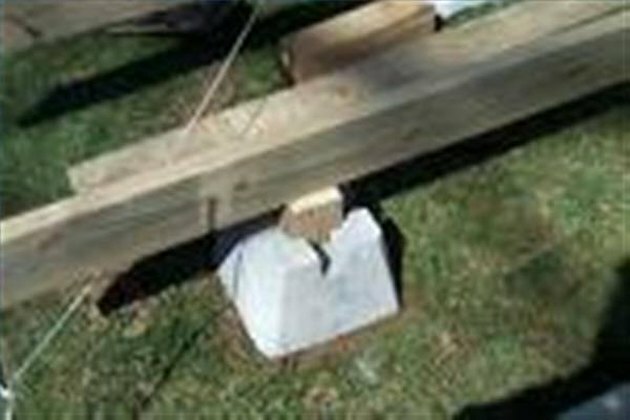 One of the most important aspects of building your deck is that the piers, or posts, do not shift once they are in place. The structural integrity of the deck depends upon strong, solid piers. Without a stationary structure, your deck could end up slanted or worse. With a few steps, you can ensure that your deck will be standing for years to come. Obtain the appropriate building permits for your project along with a copy of the building codes for your location. Layout the design for your deck using string and stakes, designating the pier placement. Follow your local building codes for deck pier spacing. Dig your holes 12 inches to 60 inches deep, depending on your location. You want to make sure you go below the frost line, so the colder your climate, the deeper your holes need to be. The average diameter of deck pier holes is 16 inches, but you should check your local building codes for specifics. Make sure your holes are straight, not sloping. Mix the concrete and pour it in the hole about 1 inch from the top. Level and smooth the concrete with your trowel. Place the pier block into the fresh concrete. Work the block down until 3 to 4 inches of the pier block is embedded in the concrete. Make sure the block is aligned and level. Drop your plumb bob from your layout string to check alignment. Also use your level to ensure your block is where it needs to be. Make any adjustments necessary to the pier block, keeping in mind the importance of a solid foundation. Tap lightly with your sledge hammer to move the pier block as needed. Wait for the concrete to dry as per the mixing instructions. Set your posts and build your deck.